After several months of rest and relaxation one of our most familiar mammals is now beginning to feel the urge for a tasty worm or insect. 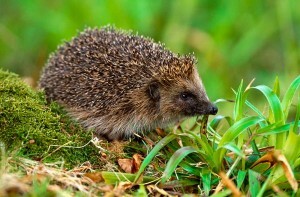 The hedgehog hibernation cycle is very much dependent on weather and may begin anytime from as early as late October through to as late as January depending on climate. Hibernation ends as the weather begins to warm, usually around the end of March and beginning of April. During the deep sleep hibernation phase, a hedgehog’s heartbeat may drop from a usual 190 bpm to a low 20 bpm, complimented by a 25 degree decrease in body temperature from 35 degree to around 10. This is also supplemented by a very low breathing rate, with a breath been taken only every few minutes. Interestingly this is not always continuous, and whilst hedgehogs rarely leave their nest during this time, they may occasionally become somewhat more active and awake for relatively brief periods. Of further interest is that in warmer countries this hibernation may not take place at all; and even in the UK it is feasible that if climate conditions and food supply are good enough our own hedgehogs could skip hibernation for that year. Hibernation is driven by the cold weather making their food sources more difficult to find. The deep sleep allows for energy to be conserved in the best possible way, but is not without cost. Many hedgehog deaths occur during this time due to temperature and if reserves were not sufficient prior to starting hibernation. For those that do make it through hibernation, their first priority is to find food and replenish their bodies in the short time before the commencement of the breeding season. Hedgehogs produce one or two litters per year of around 5 young hoglets between May and September. The young hoglets leave the nest at around 4 weeks and strike off on their own after 6-8 weeks. Unfortunately, hedgehogs numbers have declined greatly due to the actions of man, along with much of the UK’s other wildlife. This decline has been due to a huge variety of causes such as habitat loss, use of chemicals such as pesticides and slug pellets and those killed on our roads amongst other things. 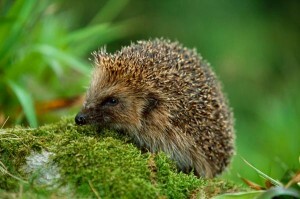 However, hedgehogs can survive well in gardens, especially when given a helping hand. The list and suggestions below is far from exhaustive and we will be covering certain areas in more detail as the year progresses. Starting with possible hazards that we can help negate include avoiding the use of pesticides and slug pellets in favour of less damaging pest control methods such as a ‘beer-trap’; being aware that hedgehogs may nest in long grass (especially pampas grass) and checking for their presence before using a lawn mower or strimmer; ensuring that there is an escape route out of garden ponds (which should be provided for amphibians anyway); being aware that netting and containers such as yogurt pots may ensnare foraging hedgehogs and finally being very careful before turning over compost heaps, burning garden rubbish and of course before setting fire to your bonfire on November 5th. As well as taking preventive measures we can also take proactive measures to help our nighttime visitors. Most obvious of these is supplementing their natural diet by providing extra food. Contrary to popular belief they should not be fed bread and milk. Instead you can try a meat based pet food, cat biscuits or specific hedgehog food should be used, and this should be complemented with fresh water. If you wish to go the ‘whole hog’ (groan..) then you could make a hedgehog feeding station by creating an area that is accessible to hedgehogs but not other larger mammals. A plastic or wooden box with a 5” square hole is ideal, this should also be weighted down to avoid been pushed or blown aside. Once your local hedgehogs have been wined and dined you may also like to provide them with a place to stay. This can be in a variety of forms from very simple to more grandiose designs. In return for your kindness hedgehogs visiting your garden will do their very best to round up and remove many of your gardening enemies such as slugs and snails, and most likely provide you with some entertainment on the way!